"How Long Do Shibas Live?" A question frequently asked by someone considering adding a Shiba to their home, or who is new to the breed, is “how long do Shibas live”. Often the answer is about the oldest or longest living Shiba that we know. However, that age is not the typical one. We see some range of ages in books or on websites but what is the basis for those claims? It’s probably anyone’s best guess. In an effort to answer the question in a factual manner, a compilation of the actual ages at which Shibas have died was initiated. The way in which the ages were gathered for the initial study, and the small sample size, may have biased the results to the high side. However, this hopefully will be an ongoing endeavor and the results will be more accurate as additional Shibas from the past are included. If you have a departed Shiba, and would like to participate in the study, please send the following information to pepperpaws@windstream.net: AKC registered name, registration number, date of birth, and date of death. The name and/or registration number is to prevent any Shibas from being included more than once. 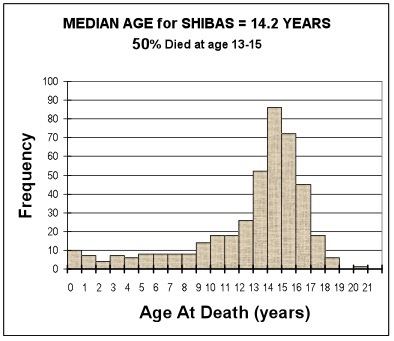 The graph shows the frequency distribution and some other stats, including the median age at which the Shibas in the study died. Median is the age at which 50% of the Shibas died younger than it and 50% died at an older age. My expectation had been that Shibas lived longer than the preliminary data indicates. Hopefully, that will be true in the future and that the longer lives will be accompanied by good health. Geert Jan Wagemans has a wonderful tribute on his website to Veteran Shibas and to those that have died. Please take a few minutes to visit his website and appreciate the love he shows for the seniors.